Well, to start with, our Bonneville plans may be altered after the issues we had this weekend. With we arriver at the races just after noon on Saturday and met our partner and his wife Mary and son Matt. The weather was warm during the day but not really hot. The car easily passed inspection and we started making some of the adjustments we had planned to test out before Bonneville. 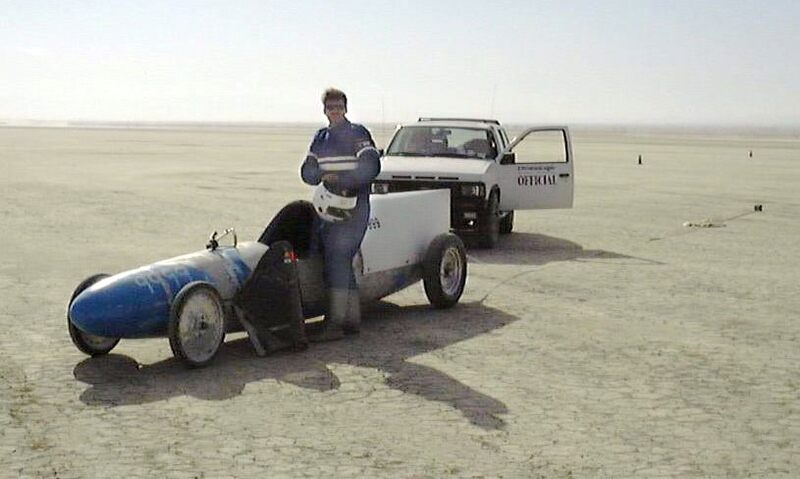 The 2 major changes were, attaching the air scoops to the motor's air box, and installing the taller gear ratio that we are planning to use at Bonneville. 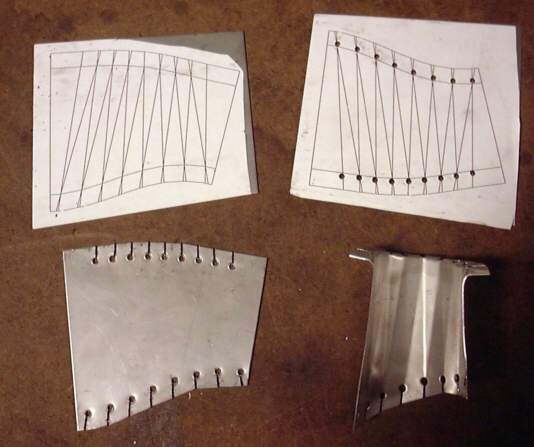 The air ducting part was accomplished with a few custom parts James manufactured at his work. The Turret-Punch was down so he made the parts by hand. The other change involved removing the 40 tooth rear sprocket and swapping in a 32 tooth. This gives us a 25% "taller" ratio which we will need at Bonneville. The physical gear is much smaller then the original and the smaller size allowed us to raise the rear part of the body for a better angle to the on-comming air. Sunday we were 23rd in line to run. I (Alan) was driving and with the new gears and looking to go as close to the current class record as I could, the plan called for me to go through the timing trap at 8700 RPM in fourth gear. Mark drove the push truck and pushed me and the race car off of the line. Right after I was on my own I knew that something was wrong, the motor did not want rev up, not even with the clutch pushed in. I struggled down the track and only managed to shift into third gear by the end. As I went through the finish line I discovered another problem, something we knew could happen but had been trying hard to avoid doing. The air recharge switch for the parachute had been left in recharge. This switch is actually our old "choke" switch and we have been planning to remove it and install a momentary push button switch (which can NOT be left in the wrong position). Fortunately the driver can operate the recharge switch while driving, so I flipped it off and deployed the 'chute. With all that going on while trying to slow down I wound up near the end of the track and stopped near one of our oldest and dearest racing friends, Steve Toller. When we first got into this type of racing Steve was driving one of the most competitive cars in the association. At this time, Steve's team was number 1 two years in a row. Unfortunately for us, our car was physically the closest in size and type to theirs of any in the association and as such were competing for the same records. But Steve is one of the best sportsmen I've ever met and often helped us with encouragement and advise. This very friendly rivalry continued for the first few years of our racing and helped us to become a better and faster team. The climax came 10 years ago as I was suited up and strapped into our car right next Steve in his. We had never broken any of their records and here we were about to go as close to head to head as you can. Steve went first on a run that almost certainly would set a new record, but unfortunately for them their car broke and Steve turned out. Now it was our turn and our car ran perfectly. We just barely broke their record and they were among the first to congratulate us. This type of competitive revelry among the best of friends is one of the biggest reasons why we keep racing. Unfortunately there was nothing to congratulate about the first run this last Sunday, I only managed 105 MPH. We assumed that the problem is with the NACA duct placement so near the canopy. They work when the canopy is not installed, but at speed, the boundary layer of air that should go down the duct is pushed away by the canopy. This actively prevents air from getting to the engine. We pushed the car back to the pits and removed the ducting connecting the air ducts to the air box. Then waited for the second round of racing. Again I was driving with Mark in the push truck, James was working in the timing stand. James & the timing crew heard the starter announce our car but we never showed up. As soon as I was pushed off the engine revved right up, but I was getting no power to the wheels. I tried second gear in case it was an issue with first gear but again there was almost no power to the wheels. This was the first time I could think of that I had to turn out and even before we had gotten going. I coasted right into our pit, the clutch apparently broken. We had assumed (wrongly) that the Hayabusa clutch springs would be stronger than they turned out to be. The combination of the heaver vehicle and the much taller gears was too much for them. So that brings us up to our Bonneville plans. As it turns out it was a very good thing we tested the combo here first. This gives us a week to get it fixed, which we are planning to do. If however we can't fix it, well there's no reason for anyone else to go to Bonneville. I'll keep you all posted as we ourselvs determine what's going to happen. Stay tuned for updates this week about our plans.